This is my first Top Ten Tuesday link-up so thanks to The Broke and the Bookish for having me! 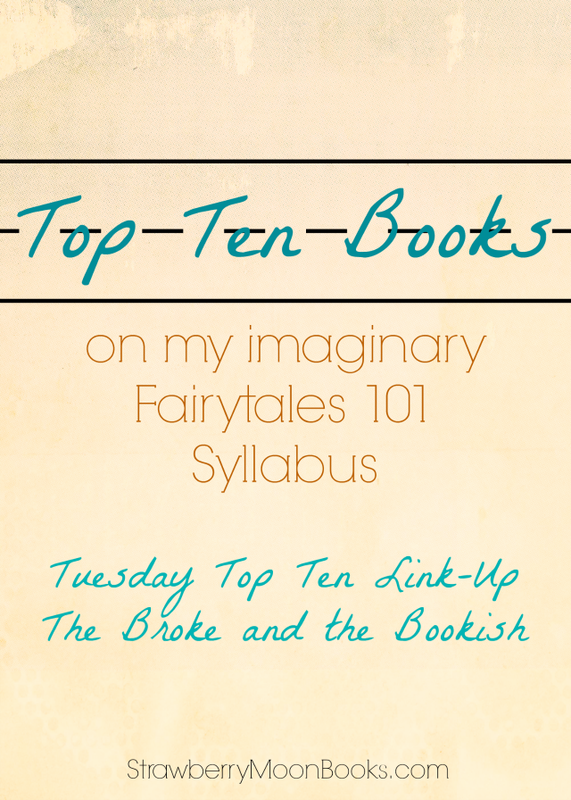 This week’s theme is the ten books that would be on your syllabus if you taught a themed 101 class. It took all of about half a second for me to decide that my theme would be fairytales: classic, modern and academically dissected. I’ve loved fairytales for as long as I can remember, especially the deconstructed, retold kind of fairytales. They get at the heart of human issues in a way that is both universal and impossibly complex. Fairytales have layers of meaning across cultures and times and imagery that is immediately recognizable in any context. So welcome, students, to Fairytales 101! On your syllabus, you’ll find ten books, most of which I discovered when writing my undergraduate thesis on 20th century Sleeping Beauty illustrations. We begin with the classics, the source material for the Western fairytales reinterpreted by everyone from Disney to Burton. The Allies’ Fairy Book by Edmund Gosse: A fascinating collection of fairytales from each of the Allied nations of World War I. Both political and literary, it is the perfect transition from classic fairytales into modern reinterpretations. With a firm foundation of the classics, we move onto modern interpretations of the fairytale genre. These include both retellings of old favorites and entirely original stories which include fairytale elements, whether they be magic, princesses or proverbial rabbit holes. The Night Circus by Erin Morgenstern: A book of magic circuses and fanciful ice gardens, The Night Circus is one of my all-time favorite books and I would be delighted to share it with a roomful of students and fellow fairytale lovers. Neverwhere by Neil Gaiman: Gaiman’s protagonist goes off on an adventure that’s fraught with tension and dark magic, right in the heart of modern-day London. The Princess Bride by William Goldman: Though the movie is perhaps more well known, the book is a valid and wonderful take on fairytale romance and adventure. Transformations by Anne Sexton: The most radical of the modern choices on my list, Anne Sexton’s infamous work of feminist poetry and fairytales is practically a classic in its own right. Finally, it wouldn’t be a syllabus without a few academic volumes scattered throughout. But these aren’t any dry books to be skipped over! In fact, these are two of my favorite books on the list. Once Upon a Time: A Short History of Fairytale by Marina Warner: A sharp and intelligent examination of the history of fairytales. 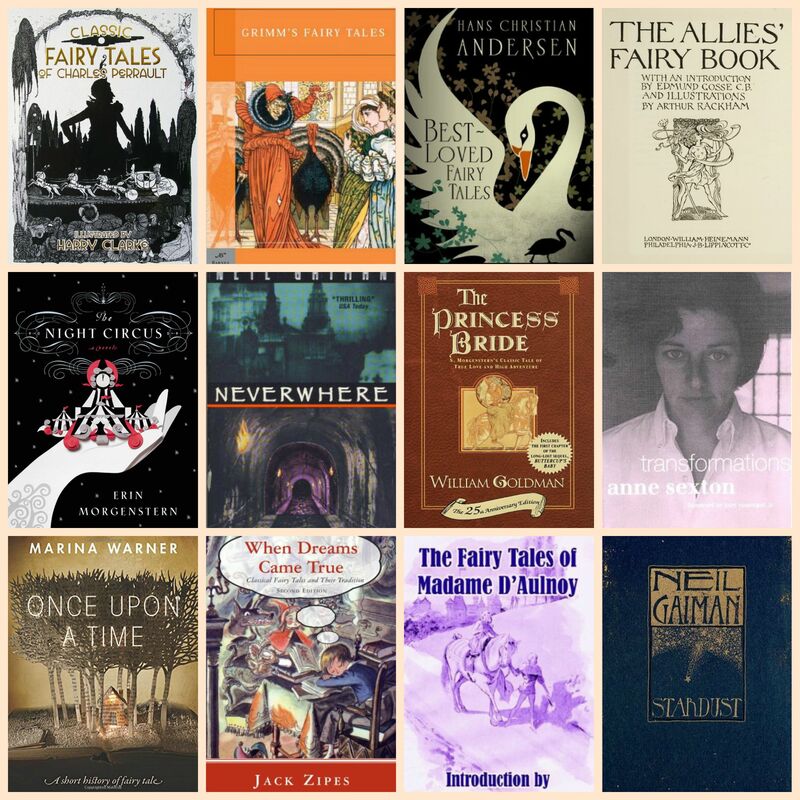 When Dreams Came True: Classical Fairy Tales and Their Tradition by Jack Zipes: Zipes is the highlight of any fairytale list and the absolute authority on all things fairytale. It just wouldn’t be Fairytales 101 without him! The Fairy Tales of Madame D’Aulnoy: Fairy tales contemporary of Perrault’s works but by a rather awesome female author. Stardust by Neil Gaiman: Because one can never have enough Neil Gaiman. And because I have such a soft spot for falling stars and earnest British boys. So what do you think, imaginary students? Would you take my class and eat up this fairytale list like the Wolf ate Grandmother or run out of the woods before the add/drop deadline? I love, love, love The Night Circus. I wish I could read it for the first time again! Me too! The imagery in that book gets me every time – she has such a talent for description. Haha, this course sounds like a lot of fun. I remember really liking Anne Sexton’s Transformations when I first read it in college – did you ever read Angela Carter’s The Bloody Chamber? I remember that being another favorite around the same time. 🙂 And the Warner and Zipes books are both great – I think I read them both in college at some point while working on a paper about fairytales. Oh! And this is Layla from The Midnight Garden. Wrong account! Didn’t want you to think I was some rando. Hi Layla from Midnight Garden! 🙂 I think I may have read some Angela Carter in a lit class at some point but she isn’t as fresh in my mind as Sexton. They’re both fairytale legends though. Zipes is an absolute favorite of mine – I think I cited four or five of his books on my thesis! To be honest, I’ve only ever read Gaiman’s Neverwhere. (Stardust is the only book on this list I haven’t read – I have major love for the movie though.) He’s fantastic and I love his storytelling wherever I run into it but I’m with you – never managed to read much of it. It’s so nice to chat with someone familiar with so many of my favorites though! Me too! 🙂 If you liked The Night Circus, you should definitely at least try out the books by Neil Gaiman – his writing is really lush too.